After my blog post about the .TDF Fonts file specification is decided to write a little tool myself. I also have a large collection of TheDraw ANSI fonts to check out. The Editor “TheDraw” is also available for download here. To be able to run the Editor, you require an emulator for MS-DOS. I recommend DOSBOX, which is also available for download in my downloads section. 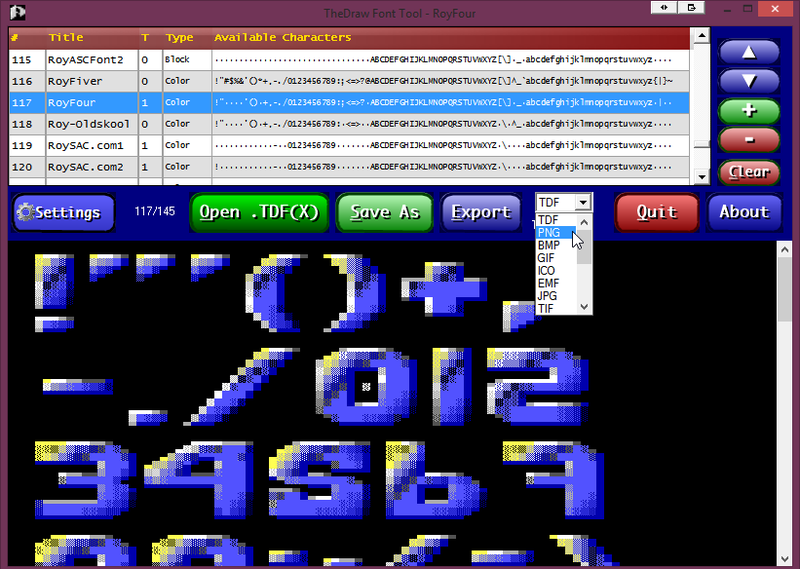 .TDF Files are font files for TheDraw, the ANSI Text Editor for MS-DOS. The Editor comes with a tool for managing .TDF files called TDFONTS.EXE, but my tool provides some features that are not provided by the original tool. Also my tool is for Windows, meaning that you don’t need an MS DOS Emulator like DOSBOX etc. to run it. Rename FontsSimply double-click on the title column of the font. Change SpacingSimply double-click on the spacing column of the font. Change Font Type: “Outline” to “Color” or “Block“, “Block” to “Color” or “Color” to “Block“Simply double-click on the Type column of the font. My .TDF Fonts Tool is available for download here. Included in the download package is also a collection of 145 TheDraw fonts in .TDFX format.